Despite being busy we are making some time for fun. It's hard to believe that it is already almost the 4th of July which marks the "halfway" point of summer. It's also hard to believe the wedding is 5 weeks away!!! Jenna spent the weekend with her dad at the cottage on Big Star. She got to stay an extra couple days for "Kiddie Kuzins Kamp". Papa and Nana Meyer take the grandkids up in various age groups and last weekend was the 3 year olds turn. Along with Luke and Jack (both 3 as well) it sounds like they had a lot of fun. As for liking lake water versus pool water...she loved it. I thought for sure she would be hesitant to jump in the lake but as soon as she saw her older cousin Lindsey head into the water Jenna put her life jacket on and jumped right off the end of the dock! She even loved being thrown from the end of the dock and would come up from the water laughing away! I can't wait to get some pictures. 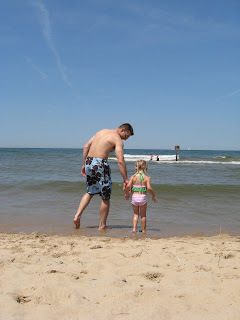 Yesterday Dave took the day off work and we took Jenna to the beach. 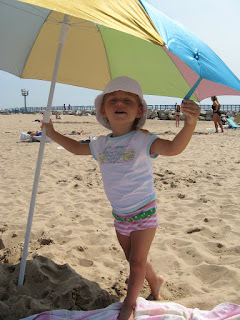 It was a great day to go since it was a very comfortable day to spend lounging in the sun and playing in the sand. The water temp was a very cool 67 and while other kids braved it Jenna got up to her tummy and that was enough...thankfully since I had no desire to be in that freezing water. I didn't get many pictures, I just don't like having the camera out in all the sand but here are a couple.